Food is the most crucial aspects of life and the basic necessity of people. As much as food is essential, its security is also a priority. To enhance livelihood, food security plays an important part which not only affects the thousands of household tables but also enormously affects the whole country. Food security exists when all people have physical and economic access to sufficient, safe and nutritious food that meets their dietary needs for an active and healthy life. Addressing the complexities of food security is the emerging development challenge for the 21st century so that people can have access to the sufficient, safe and nutritious food for their active and healthy lives. Agriculture development is also considered as a paramount strategy to feed people, reduce poverty and fuel economic growth. By providing the families of poor farmers with the means to develop their crops as well as agri-food activities, living conditions can be improved, and food security can be enhanced. There are many Nongovernmental organizations (NGOs) that are dealing with the food security and are addressing its complexity. They are putting greater emphasis on its importance. Many NGOs are working with farmers to encourage more efficient utilization of land to increase farm income and build up food self-sufficiency. To address the complexities of food security, NGOs are developing partnerships with several international organizations and foundations with the similar aims and objectives to bring awareness not only to the farmers but to a broader community as a whole. This year, FundsforNGOs is celebrating World Pulses Day with the aim of guiding and providing information to our users about the international donors who are supporting NGOs working in the field of food security with their funding opportunities. 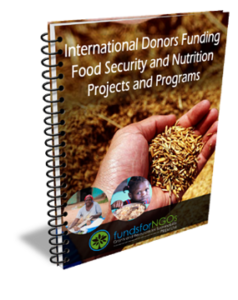 To get detailed information, you can download this guide on “International Donors Funding Food Security and Nutrition Projects and Programs” available exclusively for our premium members. If you are a FundsforNGOs Premium Member, you can download this document by logging in here. Not a Premium Member? Sign Up here. This information is available for Fundsforngos premium members only. FundsforNGOs Premium membership, offering exclusive access to the Premium donor database, grant alerts, resource guides, and training videos. To learn more please visit: https://premium.fundsforngos.org/. We offer a wide range of free resources and information to all our users around the world. All our free content will continue to be free and offered without any restriction. Please visit https://www2.fundsforngos.org to learn more. Good evening. May I please know how I can become a Premium member. Thank you for your interest in fundsforNGOs Premium. If you choose to pay via credit/debit card then your Premium Account would be activated instantly. If you choose “International Bank Transfer” then on the next page under “Your Message”, please type in the message box your username and email address and next click on “Save”. Please note that an additional amount of $25 is applicable for a bank transfer to cover bank transfer fees. We hope to welcome you as a Premium Member very soon. If we can do anything else to assist or if you have additional questions, please let us know.